Let’s get one thing straight: I’m not quitting sour cream. The stuff is a commodity in our fridge, which isn’t surprising considering my affinity for Mexican food. I love to throw a dollop onto tacos, a rice bowl, a pile of lentils, or into a batch of creamy enchiladas. Um, okay, maybe that’s more than a dollop, which further supports my point. During busy tax season in my early accounting career, when I was wiped and hungry arriving home at 10 PM, my all-time favorite was, and maybe still is, to mix up equal parts sour cream and jarred (gasp!) salsa for a creamy tortilla chip dip. Basically, I have a terrible love affair with sour cream. As my wedding approaches, though, and as I’m increasingly motivated by Rich Roll to replace animal products with plant-based versions, a daily dollop of sour cream doesn’t really work. Daisy definitely won’t be contacting me for any endorsements after that statement! Sour cream is a seemingly easy replacement, but there’s just one minor problem: all the vegan versions I’ve encountered are gross, grainy, or otherwise weird. And if I won’t eat them, I dare not even present them to my fiancé. It takes nothing short of a miracle to impress him with a vegan replacement for a favorite dairy product. I tried packaged vegan sour cream a long time ago and don’t really remember it, except that it didn’t inspire repeat purchases. Most recipes online include cashews or tofu. Personally, I’m fine with cashews, but you, or your allergy-prone kiddos, may not be. Also, who, literally, who has their wits about them to set out a bowl of raw cashews to soak at 10 PM before bed??? Don’t I have enough night time reminders in my phone already? And when I said I’m fine with cashews, I meant occasionally as a snack, but I’m not fine with their price tag for bi-weekly batches of vegan sour cream. It just seems like a travesty to me to soak and blend them when they’re so delicious on their own. Last but not least, and maybe I’m doing something wrong, my cashew cream turns out grainy 99% of the time, causing major texture anxiety. With cashews out, some vegan sour cream recipes use tofu. Again, an item I’m fine with. In fact, I’m one of those weirdos who actually loves tofu, so I probably wouldn’t mind tofu-based sour cream. However, it’s bland by nature, which really bulks up the ingredient list in the form of different seasonings and the quantity of acid needed to achieve sour cream’s signature tang. Even if all that was fixable, there is no way in this life that tofu sour cream would pass muster with my soon-to-be spouse. He can sniff the stuff out a mile away. It’s a great strategy for keeping him away from my burrito bowl at Chipotle, but not such a great formula for vegan sour cream. So this looks bleak, right? 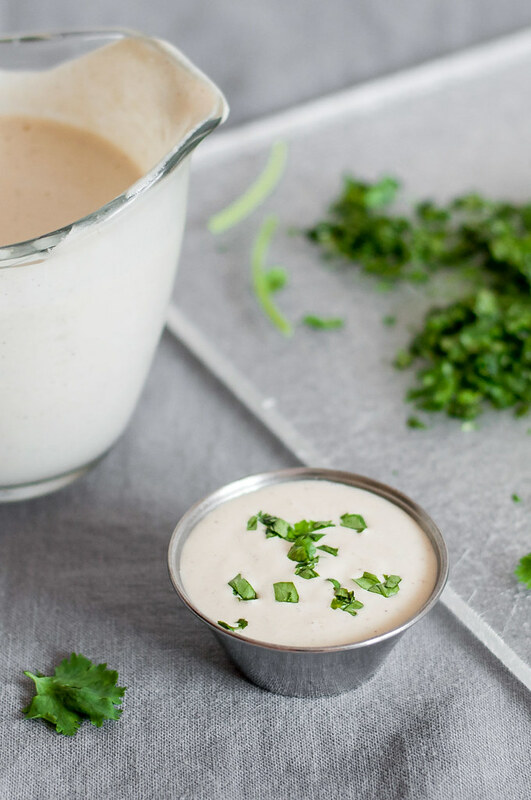 But obviously if I’m sharing this recipe today, I’m confident in my solution to the vegan sour cream dilemma which consists of…drumroll please…tahini!!! Say what? My food knowledge has expanded exponentially of late, and I’m not ashamed to admit that five years ago, I probably couldn’t tell you what tahini was or where to purchase it. The answers are simple: it’s sesame seed “butter” and it’s available at any grocery store with a decent selection of healthy and/or international cuisine, online, and possibly even in bulk at Costco or Sam’s Club. Because once you try this stuff, you’ll need vats of tahini for the quadruple batch of vegan sour cream that you make every week. Just as spaghetti squash, however much we love it, will never get confused with a real pasta noodle, tahini vegan sour cream isn’t going to taste identical to dairy sour cream. It’s smooth and creamy like the dairy version, but it does have a nutty sesame taste, as expected from sauce composed almost entirely of sesame seeds. Here’s how I introduced it with success: at your next taco or chili buffet, set out the container of dairy sour cream and the new vegan sour cream. Don’t just yank everything your household knows and loves; do it gently. Leading by example, not with force, is the best tactic I’ve employed in introducing healthy changes at home. It’s how I got Steve Steve decided to drink his first green smoothie and sometimes choose meatless meals, even when he’s at work, unsupervised by me, at lunch. It’s just so much more enjoyable to live with balance, free of absolutes. A huge burden is lifted when you’re not constantly trying to change the uncontrollable, and you might be surprised at who volunteers to try some vegan sour cream without any prompting whatsoever. Addicted to sour cream? So was I, but all that dairy isn't great for your health or waistline. 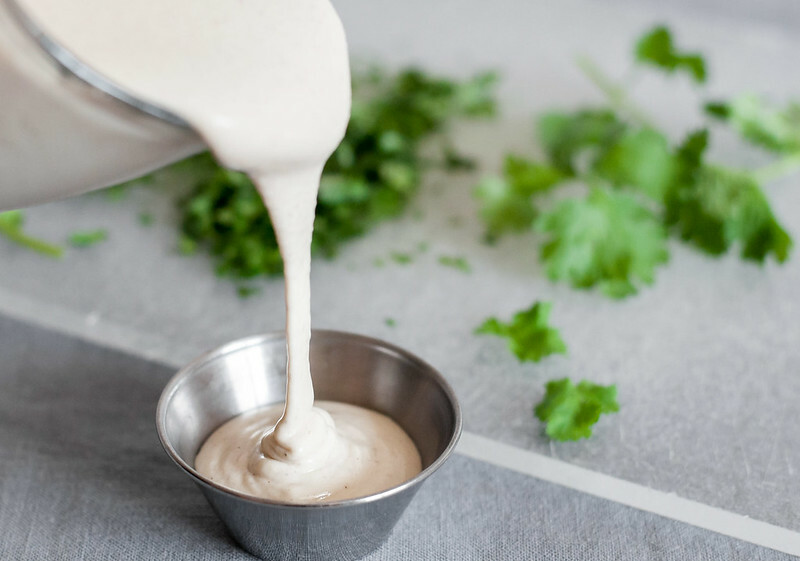 Change up your sour cream routine with a simple tahini version. 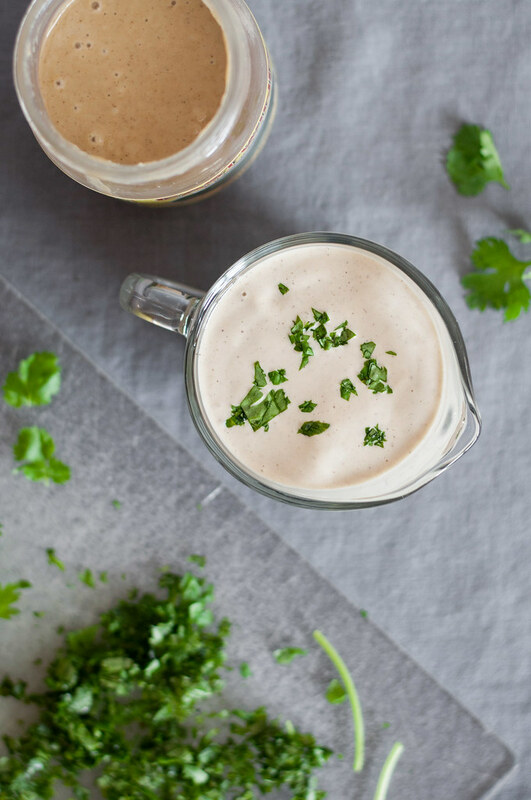 Lime juice adds a touch of Mexican flavor and that tang you might miss from dairy sour cream. 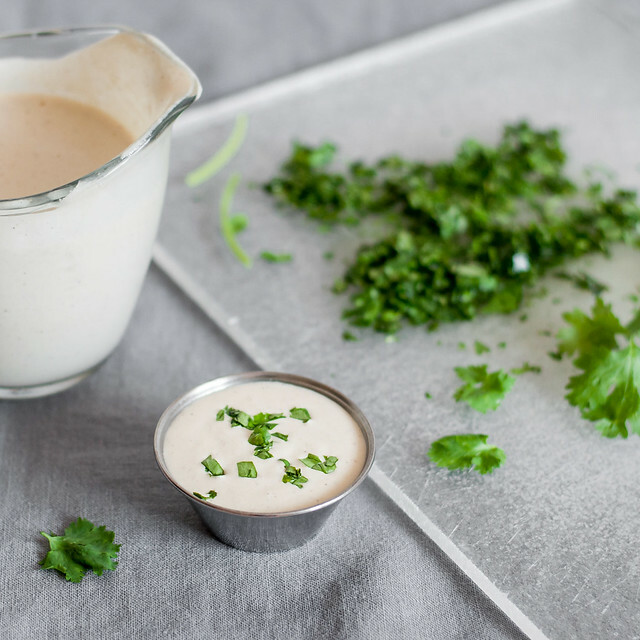 Use it anywhere you'd use cold sour cream, or thin it with more water and use it for a healthy but creamy salad dressing! 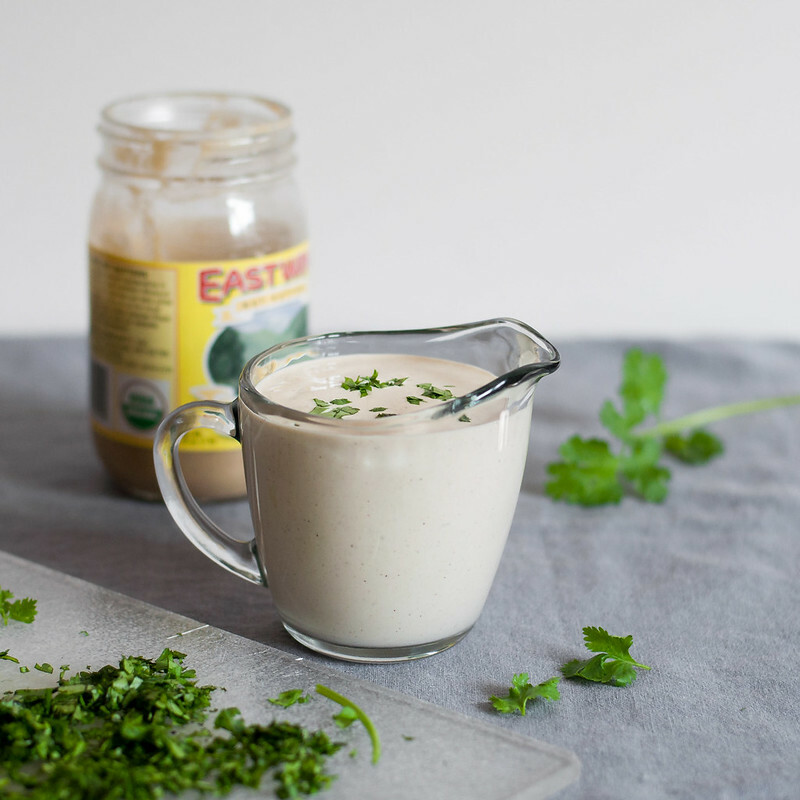 Place tahini, water, lime juice, garlic and spices (if using), and salt in a blender or food processor (don't fill food processors above the liquids line). Blend or process until smooth, then drizzle in oil while continuing to blend. Sauce will thicken when oil is added. Taste and season with more salt if needed, quickly pulsing to combine. Stir in cilantro, if using. Chill in refrigerator for an hour or two, or use immediately if you don't mind room temperature cream. "Sour" cream will keep at least a few days in the refrigerator. If you want enough for 4 without leftovers, halve the recipe. However, the larger batch you make, the better the blender generally handles it. If tahini is separated in the jar and very difficult to scoop out, empty the whole jar into blender and process until smooth. Replace into jar, leaving the quantity you need in the blender. If you can find raw tahini, use it! I've heard a lot about raw tahini lately, but haven't been able to find it except online. For most tahini, the sesame seeds are toasted before being processed into tahini, but raw tahini skips toasting. You'll note a slightly bitter taste in conventional tahini, which is apparently barely discernible in raw tahini. 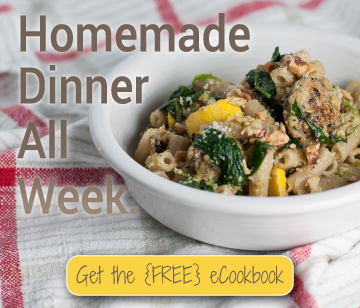 The recipe is vegan (including dairy-free), gluten free, and nut free. costs, so I can keep bringing you tangy recipes like this one. Thanks! Sarah–genius. That didn’t even occur to me. Thanks for sharing–your comment reminded me that it’s been too long since my last batch of this and I, too, need to resume putting it on everything! Have a great week! have you used this in baking recipes? Nancy–I wouldn’t recommend this as a substitute in baking recipe. It’s best for use as a condiment. Thanks! Dear dear merciful sweet sweet baby jesus is this stuff amazing. DH and I are new vegans. Well, I guess “jumped-up vegetarian” would be more accurate. I’m having a tough go of giving up greek yogurt and eggs. I’m making “beef” stroganoff tonight and I whipped up a batch of this to use in place of sour cream. I almost lost my fool head and licked the blender blades, because I ran out of other coated surfaces to lick. I am just blown away. I used lemon instead of lime juice because we’re using it in a more “homestyle” recipe. But I can’t WAIT to have this on my Thug Kitchen butternut squash burritos! THANK you!! This stuff is GOOD. I’ve been looking for something that would act as a vegan crema for soft tacos. I make stuffed poblano peppers with seitan and chocolate mole sauce, this will be excellent for that. And I want this on nachos. Or I’ll mix this into tomato sauce for a creamer texture. Or I’ll just use this as a base for a salad dressing! Add a little ginger and miso, yum…this stuff is going places!